Fairies. How has it taken me this long to cover these amazing magical beings? As a hedgewitch, working with the spirits of the land is just one of the many things I do, and fairies are a pretty important one. I'm not going to go into too much detail about fairies in this post, but if you are interested in learning more about fairies, please refer to W. Y. Evans-Wentz's book The Fairy-Faith in Celtic Countries. This amazing piece of literature is just one of several texts on which Traditional Witchcraft, including hedgewitchery, is based and is a must read if you wish to work with fairies or even understand the history of witchcraft and folk magic. But I digress! Today we are going to look at how you can invite fairies into your garden to help it grow and add a bit more magic to it. I planted almost all of these in my garden. I'm only missing coneflower (which I will plant next year) and lilac (which I will likely plant next year too). The best part of these particular plants is they are also ones you will often use in magical workings, recipes, and herbal remedies. Foxglove and morning glory are toxic, so don't use those, but the others are safe! 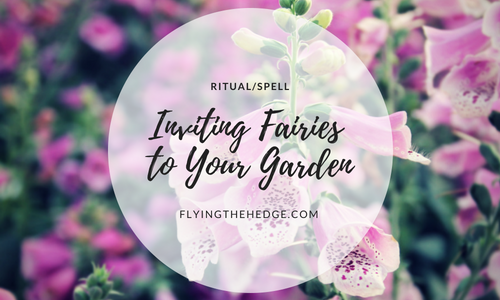 If you want to specifically invite fairies into your garden, try the following ritual. I invite you to dance in my yard. And brighten my garden with your smiles. And fill them with magical powers. By the light of the moon's glow. By my will, so mote it be." Once you are finished, spend time with your altar until the candle burns low. Try and sense the fairies you have invited. You may feel the hair on your arms stand up or as if something is playing with your hair or ear. Leave the offerings on the altar overnight. Do not consume any of the food offerings you leave for the fairies. It is considered rude and disrespectful. Also, don't expect the offering to disappear. Fairies consume the astral or spiritual essence of the offering. Leave the quartz on the altar indefinitely. Remember to record the ritual in your BOS or on your ritual log worksheet. This spell, as mentioned, is best performed on or around Beltane or Midsummer. The reason for this is because these are two times when the veil for fairies is thin and therefore they are most likely to come out and be willing to take up residence in your garden. However, fairies can be called upon any time of the year, so feel free to use it whenever you get the change. The candle helps to focus your spell and gives the fairies a light to use to guide them to your garden. Your candle will burn in this realm and the Otherworld, acting as a beacon to draw the fairies to you. Fairies don't like to be thanked, but they love to be shown respect in the form of food and shiny objects. Milk, cream, beer, or any of the other food offerings mentioned above are fairy favorites. Including such an offering in our ritual will likely attract fairies to your garden and act as a thank you without you verbally thanking them. You want to make sure the fairies are happy, otherwise, they are prone to cause mischief. The flowers are used for the same reason. Fairies are fickle and mischievous. Upsetting them can result in problems for you and anyone who steps foot on your property. Do not use pesticides in your garden. This will scare them off and keep them from coming back. Be good to the environment and animals. Fairies are creatures of the Earth; if you disrespect Her, fairies won't come to your garden, no matter how much milk and honey you offer them. If the fairies become unruly or you wish them to leave, tell them to. Cleanse your garden and home and tell the fairies you no longer need their assistance. If they still will not leave, try placing iron in your garden and around your home. Iron burns fairies so it's a great deterrent. I'm glad you enjoyed it! Thank you for reading.